Did We Get a Hit or Strike Out? Let’s explore each these issues with their solution. This is an easy one to solve – unless the chemical smell is coming from flooring. 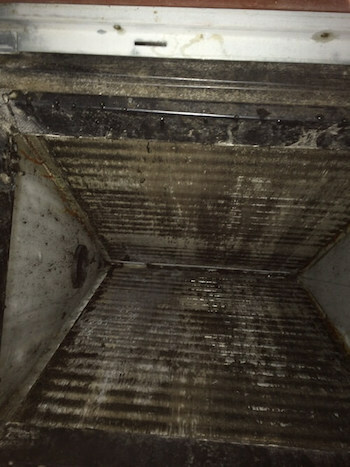 Is there anything near your furnace or air handler that has a strong chemical smell? Your air handler is pulling the chemical smell into the duct, and the blower is sending it into your living space. Store the product somewhere else, and the issue should be resolved. If flooring is leaching chemical smells, contact the seller or installer. The odor will probably subside in a week to a few months. In the meantime, you can use a fan to pull air away from the air handler. If the odor is problematic and you choose to replace the flooring, consider one that is certified low-VOC (volatile organic compounds). Ask the seller to open a box or roll out a roll of it, and give it the sniff test before you buy. Don’t use a sample of the flooring for the odor test. Samples that have been out in the air for a long time won’t have the same chemical levels as “fresh” flooring. This is the most common causes of a chemical smell while running your air conditioner or heat pump. What is smells like: Refrigerant smells a little like the coolant in a car radiator because coolant is a type of refrigerant. It has a slightly sweet aroma. What you can do about it: Your options are to investigate the leak yourself or call an HVAC company. If it is a refrigerant leak, professional service will be required. A refrigerant certification is needed to purchase HVAC grade R22 and R410A refrigerant. Ask: Is there a visible fluid leak (less likely) or is the smell stronger (more likely)? If so, you can be quite sure a refrigerant leak is the cause. The most common cause of a fuel leak is a corroded connection between a refrigerant line and the coil. The line might also have a leak, but this is less common. The cure is to replace the line, the coil or both. The system will also have to be charged with refrigerant once repaired. The coil cost ranges from $200 to $800. The line set is $75 to $185. Installation labor for replacing just the coil will be $115 to $225. Labor for replacing the line can cost $200. Recharging the system with refrigerant will cost another $250 to $600 depending on the size of the system. The recharge price given is for R410A refrigerant. If your system is older and uses R22 refrigerant, the cost to recharge it will be prohibitive. R22 is no longer manufactured, and remaining stocks of it cost up to 10 times more than R410. Unfortunately, if you have an R22 system that leaks, you’ll likely have to replace the AC or heat pump. The good news is that your new air conditioner or heat pump will be more efficient and cause less damage to the environment. Mold growth is most likely during a very humid summer. If you’re smelling chemical odor in winter and using a heat pump, mold on the coil or pan is not the issue. What it smells like: You’re likely familiar with mold’s musty smell. But it can also have an acidic odor or something like ammonia. What you can do about it: You have the same options – call an air conditioning company or investigate the problem yourself. If it is mold on the coil or in the pan, DIY cleaning is an option. If you want to check for it: Follow the same basic steps discussed above in the section on a refrigerant leak. Once you find the coil, look for obvious mold build-up. Check the pan beneath the coil. A flashlight and handheld mirror might be useful for that task. Air conditioning dehumidifies your home. As the indoor coil takes heat out of the air, the coil gets very cold. Moisture from the air condenses on it, runs down the coil into a pan and then into a drain. The environment is right for mold growth. The cure is to clean away the mold. Use a self-rinsing foaming coil cleaner for the coil. Soak the coil fins in the cleaner, and follow the instructions for what to do next. The name “self-rinsing” means that as the coil does its job – condensing and draining away moisture – the coil will be rinsed. No hosing required. A white vinegar and water or bleach and water mix can be used on the pan. You might also want to flush the drain. Our AC Tune Up Guide discusses how to do that. To keep the pan mold-free, try pan tablets. They dissolve in the condensate and prevent the growth of mold and mildew. Two tablets per ton of AC are recommended. Your AC is 1.5 to 5.0 tons, or 18,000 to 60,000 BTUs. Check your manual or search the model/serial number online to find out how large it is. The cost is minimal if you do it yourself. A can of coil cleaner is $5-$10. A gallon of bleach or white vinegar is $2-$5. Pan tablets are $5-$25 depending on the number of tablets in the package. If you hire a pro to clean your coil, it can be done as part of a complete AC or heat pump tune up. Our Tune Up Guide gives complete details on what is done during comprehensive AC maintenance. Cost of an AC tune-up is $75 to $185. These are three common causes of a chemical smell from AC. There are other types of smells – A burning smell often means wiring is overheating. A smell like gunpowder might mean the fan motor is failing or a circuit board is overheating. A sulfur smell like rotten eggs is likely a gas line leak, and the gas should be shut off until the system can be checked by a technician. If none of them prove to be the cause, we recommend calling a heating and air conditioning company. They’ll send a technician to investigate. Let us know in the comments what the cause, cure and cost was! Other readers will appreciate your information.